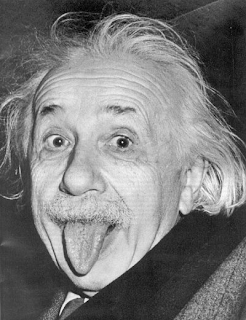 The Subversive Archaeologist: Sideways Sunday: Einstein Errs? Even I go off the track at times. But this is ridiculous. I've never gotten the whole time dilation 'thing.' As far as I'm concerned, anthropologically speaking [of course], time is something we humans have constructed to talk about processes: things that have a beginning, a middle, and an end. As an archaeologist who deals with immense time depth I can't imagine that the universe gives a flying hooh-hah about its passage. And so the square peg of 'time-space' never made it through the more-or-less circular hole in my head where knowledge usually manages to insert itself. The worst of it is that I'm not a mathematician. Arithmetic? Fine. Algebra? Barely. Calculus? Forget it. Einstein's math? Only in my wildest dreams. 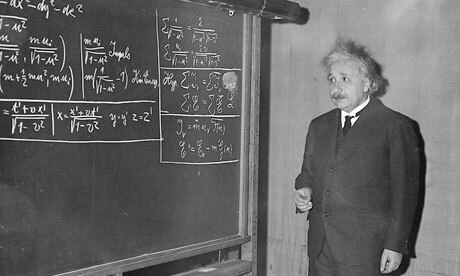 So, it's kind of funny, don't you think, that I should be worried about Special Relativity? [I think it's funny! And perverse, given my thoroughly innumerate self.] And so, what do I do about it? I end up rooting around in the most basic explanation for time dilation due to Special Relativity. And what do I find? Implications that I couldn't, in a million years, make sense of in a way that Einstein's theoretical progeny would understand. It's for that reason that I'm going to impose it on my subversive pals. See what you think. Einstein’s Theory of Special Relativity* is often illustrated using an archetypal cartoon—a clock, attached to a train, traveling at or near the speed of light. This is a kind of ‘thought experiment’, a heuristic device with a long and venerable history in physical investigation. However, as an example of temporal relativity, the ‘moving train’ model can be seen to fall short of the claims that have been made on its merits, and the mathematical constructs that would seem to support it. As I hope to demonstrate in this post, it's because the observations necessary to support the claim would be unobtainable in the physical world (the same world, one presumes, that Einstein was trying to describe and explain with his theory of special relativity). In what follows I examine the assumptions implicit in this classic thought experiment, suggest what an objective observer would really perceive as the train sped past, and with elementary school arithmetic, demonstrate that this attempt to model Special Relativity fails to represent empirical reality. Imagine that a mag-lev train is traveling from left to right, in a vacuum, in total darkness, on a horizontal, linear path very near the speed of light. The only force acting on the train is that which propels it. The train carries a very precise clock that can emit a continuous stream of photons that exits the train horizontally at 90° to the direction of travel. In Einstein’s thought experiment there is a stationary observer; in my scenario the observer is a closed-coupled device (CCD) that is sensitive enough to discern the first photon emitted and each one thereafter. The train is traveling exactly 1.0 m/s below the speed of light, or 299,792,457 m/s. Thus, during one microsecond-long interval the train travels 299.792457 m (or about the length of three Canadian football fields**). In the standard story, a stationary observer sees the light traveling further in a given unit of time than would an observer on the train. By the time Einstein was mulling this over, most of the math to support the concept was already in place, in the form of the so-called Lorentz Transformation. *** Einstein’s contribution was to propose that the speed of light is a constant. With that in mind, he inferred that time must therefore be slowed down relative to the stationary observer, even as time passes normally for a passenger aboard the train. Suppose that at the very moment the train passes at 90° to our CCD, the photon stream begins. Because the speed of light is invariable, by definition that photon would take 1.0 µs to cover the 299.792458 m to our CCD. And here is where the experiment suffers its first set-back. By definition we would be unable to begin timing the train’s progress because, simple mechanics tells us, the photon that marked the precise moment the train passed would never impinge on the CCD. Rather, after 1.0 µs the first photon emitted would arrive at a point 299.792457 m to the right and 0.000001 m to the rear of the observation point. Thus, the CCD would not have detected the first photon. Even at this early stage of the experiment one already has difficulty reconciling objective reality with Einstein’s theory, because the experiment’s success depends on an observer seeing the photon stream at the moment the train reaches a point at 90° to the observation point. For any theory to be so at odds with empirical reality, and yet be so universally accepted, strikes me as odd. For, if you can't observe a phenomenon, how on Earth can you claim to understand its behavior? Even if one were to shorten the distance of the observation point the reality would be the same. A photon emitted as the train passed a CCD only a millionth of a meter less than a light nanosecond away from the train (i.e. 0.299792458 m) would still miss the mark and would therefore be imperceptible. In this case, after a nanosecond, the photon would end up nearer to the CCD than in the previous example, only 0.299792457 m to the right of the observation point (or about the length of a northern European adult male’s foot). In reality, for the CCD ever to ‘perceive’ a photon emitted at the moment the train passes, the CCD would need to be so close to the source (i.e. one photon’s diameter away) as to render the experiment, to all intents and purposes, meaningless. And, because any photon emitted in the manner described above would continue moving away from the observation point in two directions at or very near the speed of light, our CCD would be in the dark for ever thereafter. At this point the reader might be tempted to say, “Well, this is just a thought experiment, after all. 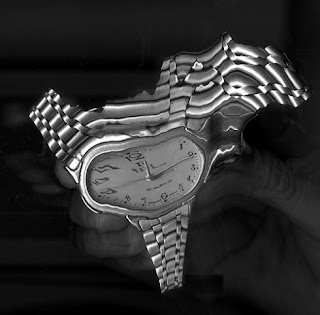 What matters is the concept.” In response, I would suggest that if the ‘concept’ cannot be replicated in the physical world, even in theory, what possible value could there be in the model as a representation of the claim that time is relative? Summarizing to this point. The photon emitted exactly at the time that the train passes the observer, and every photon emitted thereafter would be, in theory and in practice, imperceptible to any stationary observer, even a CCD capable of sensing individual photons. For a photon emitted from the train ever to reach the CCD, it would either have to be in two places at once, or be able to exceed the speed of light, perhaps by quite a bit. Thus, Einstein’s illustration fails to provide a compelling case for special relativity in a real world, and the mathematics that describe it must also fail to reproduce reality. 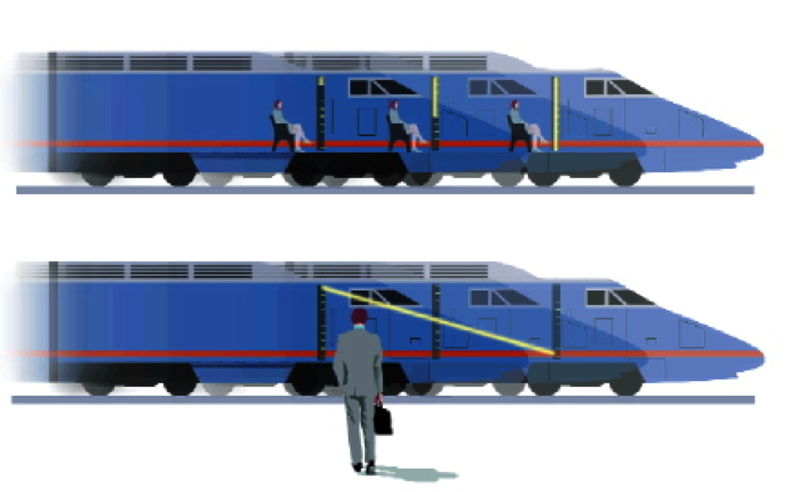 In every practical sense, to be able to track photons emitted from the moving train, our observer would have to be moving with the train, or be in two places at once. Clearly a moving observation point would violate the assumptions of the experiment, and an ability to be in two places at once would violate the laws of nature (Quantum Theory notwithstanding). How much faith or credence can we confidently place in Einstein’s experimental evidence of time dilation if it demands that light, itself, or matter, for that matter, behave contrary to physical limits? Another manifestation of Einstein’s thought experiment involves a train traveling at speeds much more amenable to human perception, such as the TGV or the Bullet Train. In this alternative experiment, on board the train a beam of light is emitted from the ceiling, and aimed at the floor, such that it spans a distance of approximately 2.5 m. The observer on the train sees a constant beam of light. On the ground, the theoretical observer would see a blurred line of light that began at a point on the ceiling of the train and ended at the floor some distance to the right of its starting point. As the theory goes, the “distance” covered during the process would then be the square root of the sum of the squares of the horizontal and vertical components of the light’s travel, which is a number greater than the distance from the ceiling to the floor. As the theory of Special Relativity depicts it, the stationary observer sees that light has traveled further than it did aboard the train, because on the train it was vertical. 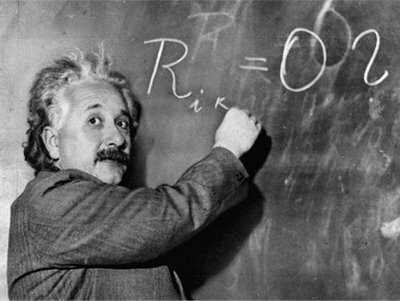 Since the speed of light is a physical constant, and the distance traveled on the train is less than the apparent distance traveled in relation to a stationary observer, on Einstein’s account time aboard the train must have slowed down. Yet, as I've implied above--in theory based on physical reality--for an observer to 'see' either the photon stream emitted by the passing train, or the photon streamed aimed vertically at the floor of the train from the ceiling, it would need to be on a conveyance of its own, have left a predetermined point to the left at a predetermined time, traveled the same distance at the same speed as the train, and converged at the same end point. In realistic terms, the moving observer would see the first photon emitted by the clock about half way from the photon stream's commencement to the end point of the journey, and the same observer would record the final photon emitted in the moment it converges with the theoretical light source. Notwithstanding the cataclysm that would result in reality when the two trains collided, I think I've made the point well enough. [And, lest you think that such experiments would be unlikely to occur in the real world, think of crash-test dummies and their circumstances, then multiply by infinity (or some factor just this side of it). ]If, therefore, one “unpacks” the assumptions associated with Einstein’s thought experiment, it becomes clear that, regardless of the inertial frame of the observer, the “light” could not, and did not travel further in relation to a stationary frame of reference. There is nothing inherently wrong with performing thought experiments, or with ‘discovering’ properties of nature in one’s dreams, for that matter. It has been known to happen. However it is crucially important that the imagined scenario can be replicated (at least theoretically) in the real world. 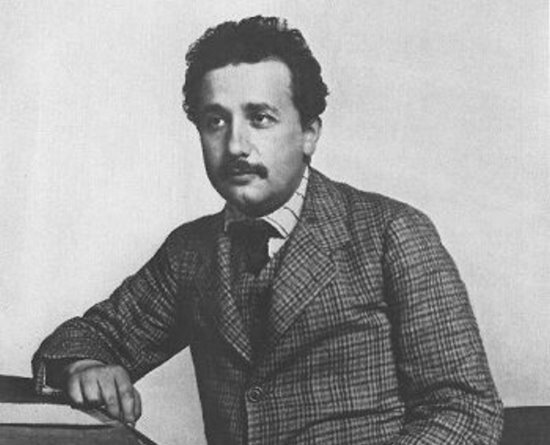 When Einstein’s mental formulation of relativity is compared with empirical constraints on observation, there is clearly no accord: infeasible observation, coupled with intractable issues of timing and the physical nature of light make this demonstration of Special Relativity appear fanciful, at best, fantastic, at worst. Granted, the existence of a train traveling at the speed of light would also be highly unlikely. However it is, at least, theoretically possible. A light generator on board is also a real possibility. Equally likely is a timepiece that could control photon emission. However, that is where Einstein’s concept and reality finally part company. After comparing the imaginary to the real it is hard to escape the conclusion that Einstein’s model of special relativity presupposes sensory abilities and light behaviors that are physically impossible. I have no idea what implications this has for the theory itself. However, someone said to me once that he could derive relativity mathematically, and that he didn’t require the cartoon or the thought experiment to help him. To him I would say simply that, while it may be possible to derive relativity mathematically, everyone knows that mathematics is a human invention, and must at times give way before ruthless empirical reality. Indeed, it seems as if one of the only ways to ‘see’ relativity is in the mind’s eye of mathematics. Ask any logical empiricist: the mind’s eye is not an objective source of empirical data. All of this might make us a wee bit skeptical of Einstein’s conclusion that time is relative. [It does me, as you can imagine.] And, after a century in Einstein’s sway, it might convince us, once again, to entertain the intuitively satisfying notion that time can neither be speeded up, nor slowed down. This view of time accords much better with the anthropological insight that the consciousness of time is peculiar to humans, and that it is a cultural construct. So much for space-time. Perhaps Time exists, not as Einstein so famously said, so that everything in the universe doesn’t happen at once, but because we humans need to communicate our perception of sequential events in nature that span intervals which are meaningful only to us. * A. Einstein, Zur Elektrodynamik bewegter Körper. Annalen der Physik 17, 891–921 (1905). ** The length of a “football” field (or pitch) is relative to the side of the Atlantic on which the English-speaking reader resides, and varies according to the rules set by the respective governing bodies of the “football” played there. On the east (or right) side of the Atlantic, the distance is 90–120 m (FIFA). On the west (or left) side of the Atlantic, the distance further depends upon which side of the Canada–U.S. border one lives. South of that line the distance is 91.44 m (NFL). North of the line, the distance is set at 100.584 m (CFL). *** Which, curiously enough, was an attempt to understand the universe in terms of the aether through which, up until Einstein's time, was theorized to have been the 'medium' through which electromagnetic energy moved (much like sound waves through air and water waves through, well, water). Wow, you have managed to critique relativity on the basis of 1) it doesn't mesh with common sense perception, 2) post-modern relativism (we can't really know anything because there is no objective "truth", and 3)the anthropic principle (whatever exists in the universe is there so we humans can observe it). Re: 1) Sense perception, common or otherwise, is the foundation of knowledge according to the logical empiricists, and of empiricism all the way back to Bacon. Their mantra was that without data that can be sensed (or observed), there can be no scientific knowledge. My problem with Einstein's thought experiment is not that it isn't commonsensical; it's that it doesn't involve sense at all, and is thus at odds with the empirical realm in which I prefer to ground the knowledge that I make and use. Re: 2) I don't recall saying that we couldn't know anything, much less because there is no objective "truth." In fact I very much adhere to the need to ground knowledge by reference to the empirically knowable. As I've said before on the Subversive Archaeologist, the radical post-modern claim that 'anything goes' only demonstrates that they don't understand the implications of their claim. If, as they'd have us believe, 'anything goes,' why should we listen to them? Re: 3) I think you've twisted my meaning with regard to our role in the construction of time. In my small world most of what goes on out there in the cosmos is of little concern to me, much less germane to my existence. Whether or not time exists as a physical parameter, the human construction of it would be irrelevant to its physics, in the same way that it was irrelevant to Light that science once thought it was a wave, then a stream of particles, and later something else, or that the moon was made of green cheese, or the earth was flat. Those forces and entities were what they were, regardless of how we viewed them. As for the ample evidence of time dilation, it matters little to me--although the demise of this thought experiment forces me to think less of it. Nevertheless, in regard to your accusation that the universe is there for our entertainment, I have done nothing of the kind. I have simply questioned the presumably 'commonsense' manner in which time dilation is described to those of us too feeble to understand the truth of the mathematical universe. Thanks for thinking of me. How'd It Get To Be Thursday? Absence of Evidence. Evidence of Absence? Is This Wild? Or What?